I'm home from Fibre Week at Olds, and while I am rested and happy to be surrounded by loving family, I'm already missing the amazing people that I just spent the week with! ...listening to Jean Curry tell us about the progress of the Master Weaver Program. This is just a small corner of the group--trust me, there were a few folks crammed into the room for the welcoming festivities and to hear Sara Lamb's Keynote Address. 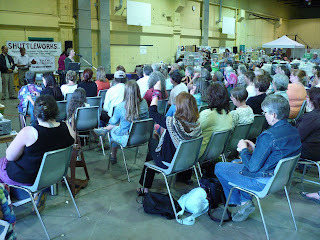 Sara spoke on a topic near and dear to my heart-the sense of community amongst fibre folk. Nowhere in my travels have I seen that sense of community more clearly than at Olds! I am always impressed with the people who take the Master Spinner Program. They come from all walks of life, all levels of education, and all parts of the continent. They bring so much collective wisdom and enthusiasm for the craft to the classroom that it becomes a joy to share what little knowledge I have to impart. I love that moment when someone goes "ahhh!" and sees something new. And I love learning new things from my class, from clever spinning tips to...ummm...colorful?...expressions and turns of phrase. 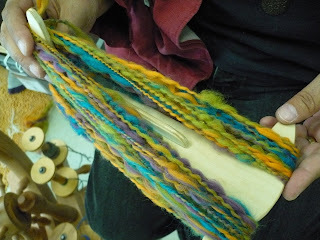 ...spinning a pretty decent yarn. Now, I must confess that Jane told me that she had spun a little before, but I will still claim that I was the one who taught her to do it right! I had several wonderful conversations with Joan Ruane, who was an enormous hit with her students. 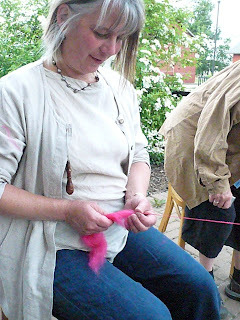 I chatted with Cynthia MacDougall about the realities of the fibre world, and I didn't get to spend near enough time talking to Sharon Costello (maybe next year, hey Sharon?). With so many instructors coming and going, I had very little time to visit with Linda Cunningham, Nancy Walker, and Linda Wilson--but Tracy Kuffner did get a chat in while she was switching from adult classes to kids' camp mode. And Jen Black, who is now a fellow Master Spinner graduate, came and went a fair bit, but still took the time to get a good visit in. 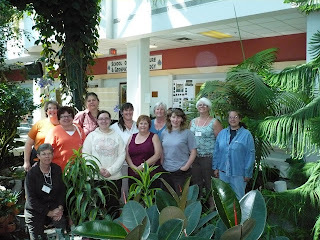 All of these amazing people, along with our Master Weaver instructor Jean Curry and my fellow Master Spinner instructors Rosemary Harris, Gayle Vallance, Colleen Nimetz, Charles Vereschagen, and Birgit Rasmussen bring so much to our community. They share their skills, their knowledge, their humor, and their passion for fibre with anyone who passes through their sphere of influence. I am honored and inspired to be in their company. As I mentioned above, though, I think I am most inspired by the students who enroll in the various workshops and classes. These are the people who make Fibre Week...and I'll tell you more about some of them next time!